The unprecedented broadcast of the live, star-studded, two-hour entertainment spectacular America: A Tribute to Heroes on Friday, September 21, 2001, served to both raise money for the victims of the September 11 tragedy and to bring our nation together to salute the American spirit. All net proceeds of this DVD will be donated to the United Way's September 11th Fund. DVD: Standard 1.33:1; audio English PCM Stereo; subtitles English; closed-captioned; single sided - single layered; 43 chapters; not rated; 120 min. ; $19.98; street date 12/04/01. After the horrible events of September 11, 2001, folks everywhere wanted to do something for those most severely affected by the tragedy. Those within the entertainment industry felt no differently, and over the weeks that followed, we found a slew of star-studded events intended to raise money for a mix of charitable causes. The first of these occurred on September 21, a mere week and a half after the attacks. Scheduled as a two-hour TV telethon that ran on all the different networks, America received an unprecedented level of cooperation from many parties. A look at the back of the DVD reveals the logos of a slew of different record companies, for although the disc appears under the Warner Bros. label, all of them cooperated for its release. All also seem to have forsaken any profits on the piece, for the cover states that “royalties equal to the distributor’s net proceeds from the sale of this DVD will benefit the September 11 telethon fund”. That’s all well and good, but if I want to donate money, I can do so directly and not bother with the DVD. Is there any reason to own it other than to support charity? Yes, most definitely. America was the first September 11 related benefit, and it’s also likely the best. Despite the extremely varied roster of participants, America holds together quite well, with many fine moments and only a few that fall flat. Musical performances dominate the show, though they don’t encompass the whole thing. The first few minutes set the tone. After no introduction, Bruce Springsteen plays a fairly new tune called “My City Of Ruin” with accompaniment solely from his acoustic guitar and harmonica plus some backing vocals from E Streeters Clarence Clemons, Patty Scialfa, and Steven Van Zandt. Though originally written about his home area of Asbury Park, New Jersey - where it was initially played during some December 2000 concerts - “Ruin” aptly fit the events at hand and established the evening’s combination of mourning with a refusal to submit and wallow in the pain. After that, we switch to comments from Tom Hanks. He formally introduces the evening, and from there, we move to a performance of “Love’s In Need Of Love Today” by Stevie Wonder featuring Take 6. The rest of the night functions in this manner, as we alternate musical performances - 21 songs in all - with comments from actors such as George Clooney, Julia Roberts, Tom Cruise and Cameron Diaz. The latter offer brief stories of true heroism that took place on September 11. I’ve browsed a few sites with comments about America, and a few morons have called it a “downer” during which the participants moped and pouted throughout the show. Those people must have watched something different than this DVD, for that’s not what I saw. I didn’t take in America during its September 21 broadcast; somehow it slipped under my personal radar and I didn’t know it existed until it was done. I really regret not having seen it live, but from the critical point of view, I think this was best. It allowed me to view the program from a greater distance; of course, I can still feel the events of September 11, but America wasn’t part of my personal experience at the time, I can see it in a somewhat more detached light. Whatever the case may be, America holds up quite well. With such a wide variety of performers, inevitably there will be many I don’t like, and indeed, America includes some folks I really dislike. However, very few of the performances seemed problematic to me, and not all of the relatively weak ones came from performers toward whom I feel negatively. No, it was not a surprise that I didn’t care for Celine Dion’s overly sugary and emotive “God Bless America”, and there’s not much that could ever make Mariah Carey’s “Hero” palatable, though she kept her excesses in check for the most part. Enrique Iglesias’ own “Hero” also came across as sappy and forced to me. More surprising to me was the lackluster offering of “I Won’t Back Down” by Tom Petty. On the surface, the tune’s tone of resolve made sense for the occasion, but it came across poorly. Petty’s attempts to glare into the camera didn’t help; I don’t doubt that Tom sincerely felt the anger he tried to display, but the emotions seemed awkward and unreal to me. I was also a little disappointed with the finale of “America the Beautiful”. Led by Willie Nelson, the track included many of the other performers and actors in a chorus. After all of the sublime and elegantly moving moments that preceded it, this presentation felt predictable and somewhat cheesy. There were many other tunes that would have better capped the evening. Nonetheless, these were minor blips during an otherwise solid program. America included quite a few performances that pleasantly surprised me. I never would have considered Limp Bizkit as a logical act for this bill, but along with Johnny Rzeznik of Goo Goo Dolls, they offered a nicely bittersweet and gentle version of Pink Floyd’s “Wish You Were Here”. Alicia Keys also gave us an inspirational and appropriately restrained take on Donny Hathaway’s “Someday We’ll All Be Free”. Paul Simon recast “Bridge Over Troubled Water” in a hymn-like manner that worked to great effect and emerged as one of the night’s most memorable moments. Ala “America the Beautiful”, the tune was one of the more predictable of the night, but Simon’s new take on it made it powerful. A visibly moved Stevie Wonder brought warmth and power to his “Love’s In Need of Love Today”, though I thought the addition of Take 6 as backup seemed like overkill. In addition, Wyclef Jean’s take on Bob Marley’s “Redemption Song” grooved well, and it stood out positively for a couple of reasons. Jean gave it an impassioned performance, and it was also nice to hear something with a little bounce to it; I understand why so many of the artists stayed with more somber, semi-acoustic works, but it was good to get something that strayed from the mold. As much as I liked the performances I’ve mentioned, not surprisingly, my favorite moments came from the artists I already preferred. Actually, prior attachment didn’t totally predict my interest. Sting’s “Fragile” and Eddie Vedder’s “Long Road” were good moments, but I didn’t find them to be exceptional. Neil Young offered a very strong take on “Imagine”, but it didn’t move me to the degree I expected based on comments from others. For me, the evening’s highlights occurred during the first three songs. Springsteen’s “Ruin” was a stellar performance that aptly encompassed all of the conflicting emotions of the evening. The rest of the night could have flopped and the program would still be worthwhile just for Bruce’s performance. However, the show’s best presentation unquestionably came from U2 with “Walk On”. Admittedly, I’m biased. As I noted in my review of their Elevation DVD, I saw the band 14 times in 2001, and six of those shows took place after September 11. The events of that date added a strong layer of depth to the proceedings, and the show’s finale of “Walk On” always capped the concerts in a powerful and positive manner. As such, I may find it hard to detach my feelings about the America performance from my prior notions, but I still thought that this was a stellar rendition. From the slightly-modified snippet of “Peace On Earth” that prefaced the tune to Bono’s wail as the band launched the song to the “hallelujah” chorus that led to its end, “Walk On” provided easily the strongest moment of the show. I’ve watched the thing three times, and it brought tears to my eyes on every occasion - it simply doesn’t get any better than that. A program that started with “My City Of Ruin” and concluded with “Walk On” would have been perfect. America: A Tribute to Heroes didn’t reach that level of flawlessness, but it still offered a moving piece of work that neatly captured both the pain and the power that followed September 11. Put this one in a time capsule, for few other programs will likely sum up the national spirit of the period so well. 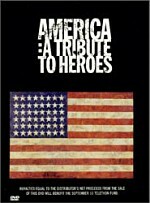 America: A Tribute to Heroes appears in an aspect ratio of 1.33:1 on this single-sided, single-layered DVD; due to those dimensions, the image has not been enhanced for 16X9 televisions. Though some moderately rough spots appeared, overall the picture looked nicely clear and well defined. Oddly, a definite discrepancy existed between the musical performances and the informative “bumpers” between songs. The latter looked noticeably more problematic. They seemed slightly fuzzy, with runnier colors and some edge enhancement. They also appeared somewhat muddy at times. On the other hand, the musical elements - the key aspect of the program - looked much more satisfying, though not without their own concerns on occasion. Sharpness largely seemed crisp and distinct. A few wide shots came across as slightly fuzzy, but these occurred rarely and didn’t offer many problems. Some jagged edges cropped up at times, but I saw no shimmering, and edge enhancement seemed absent from the musical segments. America went with an appropriately subdued palette. Most of the acts performed in front of a candlelit setting, and that kind of natural tone dominated the piece. The DVD nicely replicated the gentle and golden appearance, and the other colors that appeared - such as the red, white and blue garb of Wyclef Jean - seemed accurate and distinct. Given the somber presentation, black levels became more important, and they appeared deep and rich at all times. Shadow detail also looked clear and appropriately opaque for these segments. For reasons unknown, U2’s performance of “Walk On” appeared in black and white. I assume this was a stylistic choice, but it was the only song of the evening that went with the monochrome presentation, and it also provided the least attractive segment of the DVD. The clip looked fuzzier and less well defined than the rest of the show. This wasn’t a major issue, however. In the end, the non-musical portions showed some minor concerns, but America usually presented a very good image when it counted most. Also good but unexceptional was the PCM stereo soundtrack of America: A Tribute to Heroes. I thought the mix showed inconsistent imaging and stayed a little too heavily in the center, but this couldn’t be a very expansive track under any circumstances. Most of the songs were played with small groups, as the program included only a few full band numbers like U2’s “Walk On”. Instead, quieter, semi-acoustic tracks dominated, so the mix featured fewer opportunities to spread out instrumentation. Mostly the side channels offered backing vocals, of which the program featured plenty. Occasional distinct instrumentation also appeared, such as via the sax during Billy Joel’s “New York State of Mind”. Actually, in that instance, I thought the mix isolated the sax too strongly; it came solely from the right speaker and didn’t blend well with the rest of the audio. Overall, however, the mix appeared reasonably well balanced. Again, the subdued nature of so many of the performances didn’t really lend itself to a broad and flashy mix. As such, I found the track to appear acceptably well defined for the most part. The non-musical aspects of the show stayed appropriately centered most of the time. Tom Hanks’ initial introduction faded a little toward the left, but after that, the balance stayed in the middle where it belonged. Despites some concerns about the mix, audio quality seemed quite good for the most part. However, I felt vocals appeared too prominent in the track. These made some of the instrumentation sound a bit weak and flat in the background, as the singers definitely dominated the piece. The vocals came across well, as they consistently sounded clear and natural, but they took over the track too strongly. Nonetheless, the instrumentation appeared reasonably distinct and bright, and the program offered very solid low-end response. America showed tight and warm bass at all times. In the end, the audio of America: A Tribute to Heroes wasn’t stellar, but it worked fairly well for the material. America comes with no extras other than a weblink to the telethon fund’s site. I don’t find this surprising or troubling, but I have to mention it. America: A Tribute to Heroes won’t make anyone’s lists of the greatest DVDs in existence, but it gets the job done, and the program’s historical value makes it a compelling package. That shouldn’t connote that it only has any appeal as an archival piece, for that’s not true. The program’s too emotional to be something I’d want to watch with any great regularity, but it does contain a very nice roster of solid musical performances. America is a fine piece of work that deftly captures both the sadness and the strength that occurred after September 11, and it makes for a very interesting program.